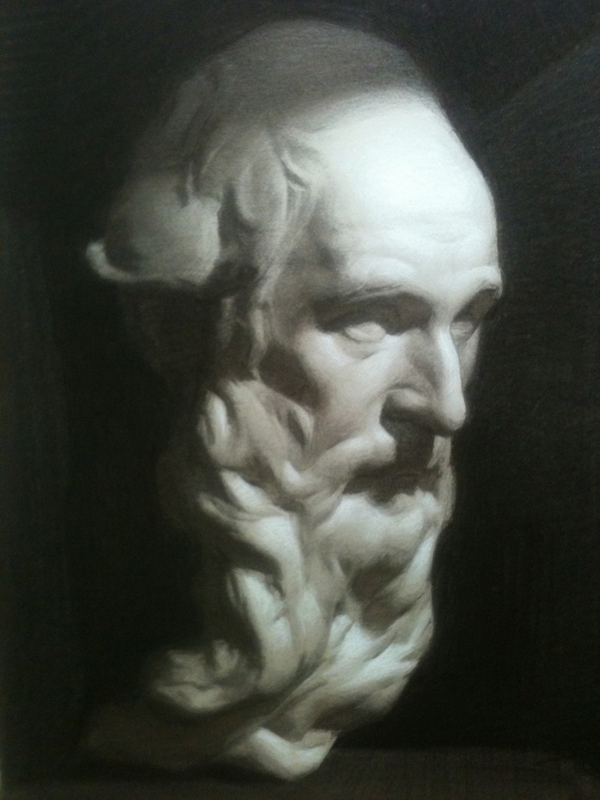 The ZAFA summer atelier is a 6 week, intensive course focusing on the principles of classical drawing and painting. Students develop extended projects while learning about proportions, anatomical landmarks, value organization, edge hierarchy, color values, temperature control, and how to create a focal point and sense of atmosphere in their work. The course is designed to give people a strong understanding of the fundamentals, then build upon those fundamentals to develop high level, finished oil painting and charcoal drawing portfolio pieces. Each stage of the workshop is designed to build upon the skills and concepts of the previous stage. Students are introduced to sight size and linear drawing in the first week of the course, then progress to values organization and later transition to oil painting where temperature and color is introduced. Students work from classical sculptures as well as live figure models using the traditional technique of sight size. Sight Size is an optical measuring technique used by artists throughout history to train their eye as well as accurately measure subjects from life. The course is taught using a combination of lectures, live demonstrations and individual critiques. This course structure creates the opportunity for a large amount of individualized instruction. Each day students will work one-on-one with instructors, discussing their projects and concepts specific to the aspect of drawing or painting they are working on. Students of all skill levels are encouraged to participate in this workshop. The course runs from 9am-4pm each weekday, with a 1 hour break for lunch. The days are split into 2 sections; the first half of the day is devoted to cast drawing while the second half is devoted to drawing and painting from live figure models. Each Friday, during the morning session, we will have guest lecturers give presentations on drawing, painting, materials and techniques as well as other topics. Each Wednesday, during the morning session, we will do a figure pencil drawing from live models in addition to our other figurative projects. July 6th--- Introduction to the course and an overview of materials and the concept of sight size, assigning casts to students and setting up workshop stations. In the afternoon students will sketch from a live model. Week 1 -- Begin sight-size construction of casts in charcoal, finding large shapes and focussing on proportions and gesture. Toward the end of the week, when the large shape and proportions are completed, students will begin to separate light from shadow with the introduction of a varied shadow line. In the second half of each day students will be doing pencil drawing of models in different poses. This is to familiarize them with using sight size to map out a figure and find accurate gesture, proportions, and body type. There will be an emphasis on anatomical landmarks and ascertaining the gesture and weight distribution of the model. Week 2--Students continue to develop their cast drawings, breaking their large block-in shapes into more refined structures. In the second half of the day students will begin their transfer drawings of the extended model pose which will last for the remaining 5 weeks of the course. Transfer drawings are done in charcoal and they are a natural progression from the pencil drawings that were done the week previous. Week 3-- Students continue to refine their cast drawings, smaller structures of the cast and shadow line. Toward the end of the week students will start to KEY their drawings (begin to organize their values in a block in manner, large shapes of value). For their model drawings, students will finish their transfer drawings, transfer them onto stretched and prepared canvas and refinine their drawings on the canvas with raw umber. Toward the end of the week students start to block in and Key their paintings. Week 4-- Students have keyed their cast drawings and begin to work on breaking down the blocked in values into smaller structures and begin to add more variety to the transitions between the different planes of the cast. In the Long pose students finish Keying their figure paintings with generalized color values (this ties into what they have already been learning while working on their charcoal drawings). We will go over how to organize warms and cools within a models flesh tones and the different local colors of the model as well has how to mix flesh tones and organize one's pallette. Throughout the week students work on blocking in their paintings with accurate color values. Week 5-- Students continue to refine their cast drawings, now focusing on edge quality, line quality, and atmosphere to begin to define a focal point. In the long pose students are now breaking down the larger planes of the model into more specific, smaller plains. Students also refine their color values and edge quality, color, atmosphere and focal point as well. Week 6-- Students focus on finishing details and refinements to the focal area of their cast drawing and work on any areas they are having trouble with. In the long pose students do the same, defining a focal point, and refining edges and transitions. August 14th. Potluck and last model session. Each day teachers will be circulating around the class giving personalized critiques focused on improving students methodology of drawing and painting. The goal is to teach students the principles of drawing and painting and not simply correct their individual projects.